You should definitely make a trip on Tuesday or Thursday night to Big Boss Brewing, when Sarge’s Chef on Wheels sets up for dinner. Not only can you get some awesome food, you’ll be able to sample North Carolina beer from one of the seven breweries in the Raleigh area. My friend Courtney and I grabbed a beer from Big Boss to start off our evening. I ordered the Angry Angel Kolsch Ale, amazing! We walked outside to Sarge’s and the first thing I noticed about Sarge’s was the great family feel. The owner was inspired by his military parents to serve foods representing the places they lived during his dad’s service in the Air Force. The food mixes Asian, Caribbean and other soulful flavors; all together, it’s creative and delicious. Courtney ordered the jerk chicken; marinated jerk chicken served on a tortilla with lettuce, red cabbage and special Sarge’s sauce. Courtney loves spicy food says the chicken definitely brought the heat! 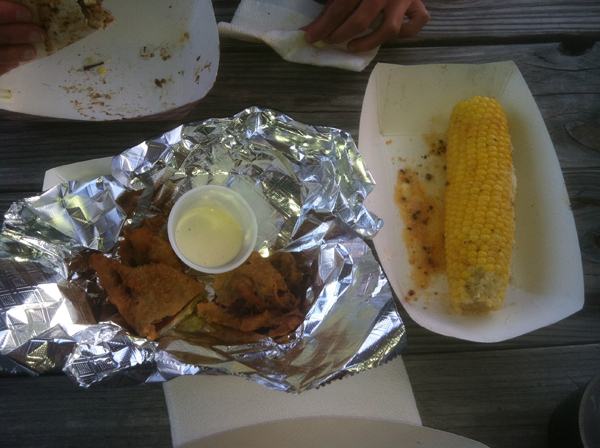 She also ordered an ear of corn served with a sweet, zesty sauce and then sprinkled with Parmesan cheese. I ordered the shrimp po boy. The local shrimp was lightly breaded and then piled high with hand tossed onion rings, lettuce and a special lemon sauce. The sandwich was massive! The food was out of this world and reasonably priced. After my first few bites of the shrimp po boy, a softshell crab was delivered to our table by Sarge himself. The crab was incredible. The golden brown crust was so flaky; the last bite left me wanting more. 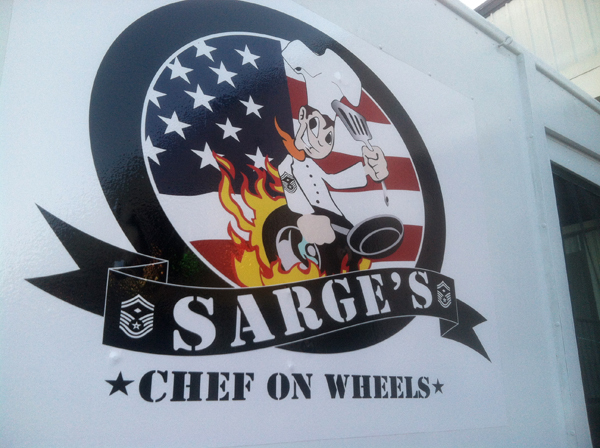 I highly recommended Sarge’s Chef on Wheels. Sarge’s is great about using Twitter to let you know where they will be located. I cannot wait to try more of Sarge’s food. The shrimp and grits, one of their signature dishes, is on my “to-eat” list. After thoroughly enjoying our dinner, Courtney and I went to the tap room at Big Boss. I had two more beers, the Belle Wringer and Hells Belle Belgian Blonde. The staff at Big Boss let us sample a few beers before deciding on what to order. 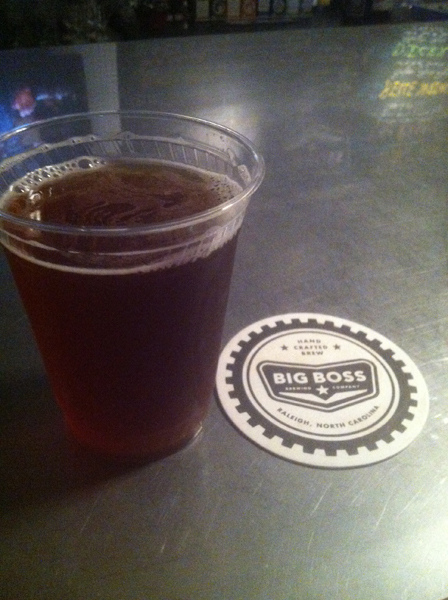 Big Boss doesn’t have a beer I don’t like. I would definitely check out the brewery and try to also go on the second Saturday of the month so you can get a tour. Asheville better watch out, Raleigh has some fantastic breweries. 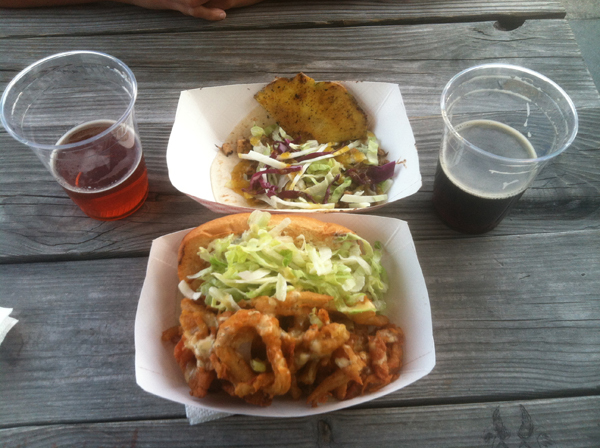 What a fabulous night, beer and food trucks! Life is good.